Owning an in-ground swimming pool in Louisiana is infinitely rewarding. But one aspect of pool ownership that people are more reluctant to dive into is the regular maintenance that a quality pool requires. However, without consistent upkeep of your swimming pool, the other benefits may fall by the wayside. Having a maintenance plan in place for your pool will keep it looking great year-round, operational when you need it, and prevent larger pool maintenance issues down the road. Check out these 7 tips for maintaining a quality pool in Louisiana! Every pool owner worth their salt (or chlorine) understands the importance of keeping their water free of impurities. Removing floating debris with a skimmer and emptying out the skimmer basket are quick but necessary parts of keeping your pool clean. The surrounding deck should also be kept clear of sticks, leaves, and other debris that could make their way into the pool. Use a vacuum to remove loose material that has settled at the bottom. If you’re using a Polaris cleaner, the bag should be emptied every other day. Finally, brush your pool weekly to remove algae, and help keep your surface feeling smooth. Your pool filter has the all-important job of making sure things that don’t belong in your pool, stay out of your pool. Having a clean filter helps the pool function properly and is an essential part of your maintenance routine. The filter basket should be cleared out once a week while pipes in your filter system should be cleaned out monthly. To clean filter pipes, set your filter to “backwash”, then remove and empty out your leaf basket. Turn on the pump and let it run until the water exiting the waste pipe becomes clear. After backwashing, turn on the rinse setting for 30 seconds to 1 minute until water in the sight glass is clear. When chemical levels become unbalanced, your pool can have a host of unwanted issues (murky water, bacteria growth, and irritating to skin). You should test for chlorine, pH, alkalinity, and copper on a weekly basis. For the sanitation and the longevity of your pool, consistently examining chemical levels is an essential part of pool upkeep. Pick up a testing kit (we recommend the Taylor K-2006 FAS-DPD kit) to determine the current chemical levels in your pool. Adjust levels as needed to keep your water perfectly balanced. How High is the Water in Your In-ground Pool? Now that your pool is clear of debris and chemically balanced, don’t forget the importance of the physical water level (target level is the middle of your skimmer opening). Adding water can be as simple as using a garden hose to return levels to normal. However, if you have too much water, consult a professional to determine the safest course of action to remove excess water from your pool. When you love your pool to a fault, you’re not afraid think outside of the box for effective ways to keep it clean. Oils produced by skin, sunscreen, and hair product can be left behind after guests exit the pool. Tennis ball fibers naturally absorb these oils to keep your pool surface clear. So the next time Uncle Bob lathers on copious amounts of tanning oil before jumping in, feel free to channel your inner John McEnroe and let the tennis balls fly. Even though use of your pool may decrease during the winter, the importance of consistent maintenance does not. Practicing the same principles discussed in this post over the next few months will allow you to pull off the cover with confidence when the days start to get warmer. Regardless of whether you consider yourself a novice or an expert when it comes to pool maintenance, consider scheduling a regular service appointment with a professional. In the world of healthcare, there is a reason that doctors recommend getting a wellness exam. Medical professionals know how crucial it is to catch a problem early before it becomes a larger issue. Your pool is no different. Even if you think everything is in top form, it’s a good idea to have a professional do an assessment (at least once a year) to make sure there are no potential issues going undetected. 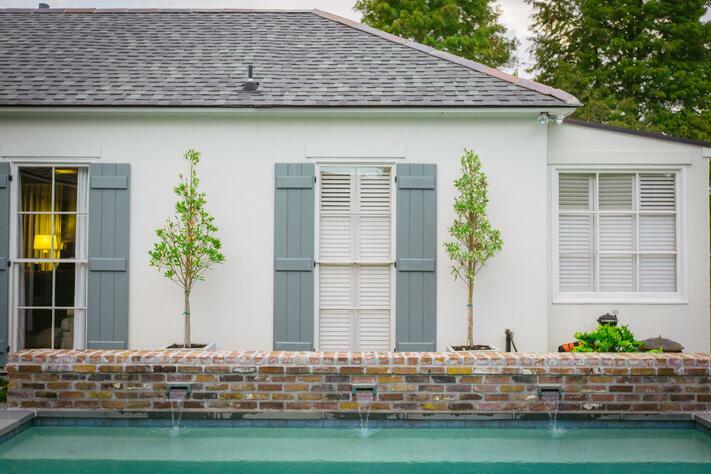 Whether you need help with pool repairs, installation, or quality pool service in Louisiana, Lucas Firmin’s team of building and service experts has your needs covered across the greater Baton Rouge area. Call today to schedule a consultation.